Leave alone seeing the gorillas in documentaries, Mountain Gorillas are only found in their natural habitat and if you want to have a glimpse of these elusive apes then you will have to go gorilla trekking to one of the gorilla families. 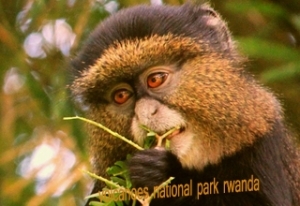 Dubbed the land of a thousand hills, Rwanda is blessed to be one of the only three countries that provide a suitable home to the mountain gorillas conserved in Volcanoes National Park. Mountain gorillas are only found in Rwanda, Uganda and the Democratic Republic in Congo. 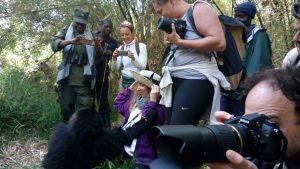 Gorilla trekking is a process or safari activity that involves hiking to an altitude of about 2,500m to 4,500m above sea level through an extensive bamboo forest to spend a single hour with Mountain Gorillas. Before gorilla families were opened up for gorilla trekking safaris in Rwanda they underwent Mountain Gorilla habituation. This is a process of making the gorillas familiar to the presence of human beings done by park rangers on a daily basis for about 1 year. After a year, tourists start going for gorilla habituation and then after about another year and a half the gorillas are set out for gorilla trekking. In Volcanoes National Park, Mountain gorilla trekking is done on a daily basis as a total of 8 trekkers are allowed to trek a single family and spend a single hour in their presence. You can only trek gorillas if you are 15 years and above and have purchased a Rwanda gorilla trekking safari permit that costs USD 1500. 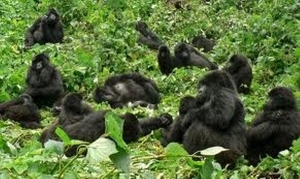 This is Volcanoes National Park’s most peaceful gorilla family with 18 members led by silverback Ubumwe. The name Amahoro originates from a Kinyarwanda (the language spoken in Rwanda) word that means serenity/calmness. This family is indeed known for its peacefulness and friendliness living to the expectations of its name. This peacefulness though has led to lose of some members to another group called Umubano. Trekking these gorillas is tasking since one has to hike Mt. Bisoke where the group established their home. During gorilla family allocation on the morning of your trek, if you can take the hike it’s an experience worth undertaking. The Umubano gorilla family is a split from the Amahoro gorilla family. The family broke away because of constant battles between Charles and Ubumwe the two head silver backs (the older male gorillas). At the time of the split, Charles broke away with 13 members forming the Umubano family, the name of the family group means living together. Susa A gorilla family was previously part of the Susa family that had 42 members before the split and was the most popular group. Susa A gorilla family was formed in 2008 after the split in the Susa family and it remained with 33 members with two silverbacks. The gorilla family lives in the lower slopes of Mt. Karisimbi, if you can’t hike further then you can opt for this gorilla family. Its popular for its playful twins Byishimo and Impano. This was the group thoroughly studied by Dian Fossey during her time in Rwanda from 1967 to 1985. After your Rwanda gorilla safari, you can undertake a tribute visit to Dian Fossey center to pay respect to the primatologist who lost her life in the Mountain Gorilla conservation process, something that has yielded results. This is the other part of the gorillas that split from the Susa family. The group has 16 members including 2 silver backs. The group inhabits the upper slopes of Mt. 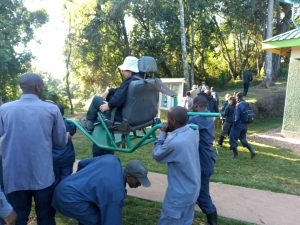 Karisimbi at an altitude of 4,507m offering a trying moment for those on Rwanda gorilla trekking safari tours who choose this group to find them. This group is suitable for tourists who are interested in a serious hiking experience. This gorilla family is popular for its giant silverback known as Guhonda weighing about 220kg. 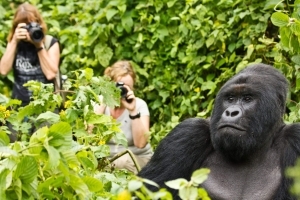 It’s the nearest and easiest gorilla family and to track on a gorilla trekking Rwanda safari. It inhabits the gentle slopes between Mt. Sabyinyo and Mt. Gahinga. The group has 13 members including one silver back after another was exiled from the group. Kwitonda gorilla family migrated from the Democratic Republic of Congo Since Virunga National Park is within the Virunga massif that is trans boundary with Virunga National Park in Congo and Mgahinga Gorilla National Park in Uganda. Its named after its dominant silver back called Kwitonda meaning the ‘Humble one’. This group has 23 members and lives in the lower slopes of Mt. Muhabura and its movement is un predictable. Ugenda is a Kinyarwanda word that means on the move or mobile. Ugenda gorilla family has 11 members with two silverback gorillas. The group attained its named because its random movement behavior which makes it one difficult group to track on a Rwanda gorilla tour. The Bwenge gorilla family has 11 members led by silverback Bwenge. The group was formed in 2007 when silverback Bwenge left his group and was later joined by females from other groups. Bwenge group occupies the slopes of Karisoke volcano between Karisimbi and Bisoke mountains. Bwenge is a Kinyarwanda word which meaning Wisdom and from its name, it’s no wonder that this gorilla group featured in the Movie titled Gorillas in the Mist. 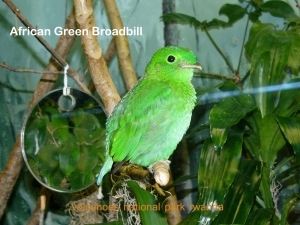 This group is named after the initial family number that was 13 at the time of habituation. 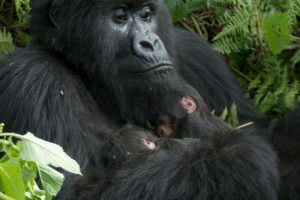 The group was initially led by a silverback called Nyakarima but was later over thrown by Agashya whose name means news which is now the leader and the family was named after him. The family as of now has 27 members. This gorilla family has 16 members with its name originating from its formation process which was out of luck, it therefore means the lucky one. This family was formed in 2006 by some members of Sabyinyo group and others from group 13 (Agashya). Hirwa group inhabits the foothills of Mt. Sabyinyo to the side of Mt Gahinga. The family is named after the Silver back Titus which was born during the days of Dian Fossey’ research at Karisoke. Titus the young gorilla lost his family to poachers including his father, uncle, brother, mother and sister. Titus was later raised by another family and considered one of the successful gorillas in history. This group is meant for research but open to tourists when other groups are fully booked. From the peaceful group, the humble one, the lucky one and all the rest with their different characteristics, there’s a reason for you to make the right choice on your trek morning. You can also tailor your gorilla safari with a Uganda wildlife safari to the close safari parks like Queen Elizabeth National Park Uganda to have a glimpse of the numerous wildlife species.